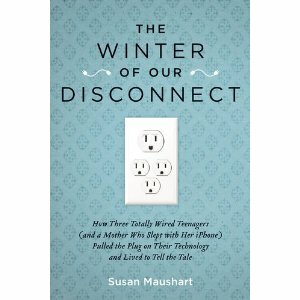 I love to read, and for Valentine's Day Paul gave me Susan Maushart's The Winter of Our Disconnect - How Three Totally Wired Teenagers (and a Mother Who Slept with Her iPhone) Pulled the Plug on Their Technology and Lived to Tell the Tale. Most books I read don't strike me so deeply as to inspire me to write a review, but this one did. I think part of it is that Maushart is so philosophical, and she pulls references from classical literature that I enjoyed. In particular, she draws a lot from Thoreau's Walden. But I confess that she really had me (and my psychology background) when she threw in a reference to Abraham Maslow. I'm a nerd for statistics and studies, so I really enjoyed that Maushart put so much hard evidence into her book. Even though I'm familiar with the plethora of studies that show the benefits of family time, in particular family dinners, I still enjoy reading the statistics because it adds more fuel to my fire to make family dinners special. It serves as confirmation - hey, you're doing something important in prepping dinner for the family every night! It's not just a mundane chore, it truly matters! I was also familiar with the study showing a correlation between autism and the amount of television viewed at a young age. I'm familiar with it because I read the entire study - all 50+ pages of it - when it first came out (did I mention what a nerd I am?). I like how Maushart talks about the findings but also discusses the criticisms of this particular study. Like all studies, it's not perfect and shouldn't be accepted at face value. However, I agree with Maushart that the study has enough truth to it that parents should consider it's results and limit television viewing, particularly with children under the age of 2 or 3. As a side note, if you are interested in the studies on the adverse affects of television viewing in children, you might want to know that there is substantial evidence linking heavy tv viewing and violence. Kids do pick up and imitate what they view, so consider that when choosing their shows (television is great and can be educational - I'm not totally anti-tv; I'm just cautious - probably a bit overly so. Pierce does watch one children's dvd show a day). And finally, I liked following how Maushart and her family fared over the 6 months. Did the disconnect, as you might expect, cause some challenges? Oh yes. Did it cause changes in the family? Absolutely. Her oldest daughter was cooking more, the middle son Bill rediscovers his love for the saxophone and music, and her youngest daughter catches up on a significant sleep deprivation and finds a sunnier disposition. In addition, they do start eating meals as a family, playing board games, and interacting as a unit in a more healthy and happy manner. I don't want to give too much detail because I don't want to be a spoiler for you. This is a book you'll want to read for yourself, particularly if you have children. It will make you groan at times, it will make you laugh, and it will make you rexamine your daily habits and ask yourself if the small moments of each day are meaningful. Don't forget to enter my giveaway to win a beautiful cedar blue bird house and squirrel proof feeder! JDaniel says he has to explore the fridge because he is curious like George. George does love to explore. Coming from an insurance background, I'm a report and statistics nut myself. Awesome book! I really have to read it!! I really need more disconnect time. Have recently discovered 'The Sabbath Manifesto' and am inspired to make a weekly unplug part of my schedule. This ties in with my post today! When the reasons for kids not doing well in school are looked at-at least around here-the culprit is often the school building. Nothing can replace the important role that parents play in the lives of their kids-including family meals together and supervision of tv watching, time on the computer, etc. The most up to date, state of the art school in the world won't do any good if those other things aren't happening. Sounds like a book I would like reading! Oh my gosh! I seriously cant imagine living without my Droid. Or my TiVo! Did they totally give up TV? Nope, I couldnt do it. lol Kinda sad, but I love my technology! Sounds like a great book! Our quality of life always improves when it's unplugged. We go screen free Monday-Friday and the boys are forbidden to engage before noon on weekends. Strict? Perhaps, but my kids are well-balanced. Now mama has to follow suit! I must read this! TJ & I have property in Southeastern Arizona where we have "shacks" with no power or water. We use oil lamps, haul water, and use a wood burning stove for heat. I even have a hand crank washer down there and we did lots of outdoor dutch oven cooking. The many times we spent Christmas down there are some of my fondest memories...playing Yahtzee by the light of an oil lamp and talking. It is so sad that is such a rare thing these days. I totally do want to read this. I love your review of it. I know you don't do more reviews, but you totally should! (Says someone who lately has probably been doing too many!) You give the insight without giving too much away! Sounds like a fascinating book. I'll have to look for it. We unplug for at least a portion of the summer each year. It's a bit rough at first, but quickly becomes much more relaxing. I would highly recommend unplugging.